In 1946, Ernest E. Caruso opened the doors to Caruso Jewelers in South Braintree Square. He was talented, hard working, and most of all, honest. He knew that superior customer service was the key to a successful, long lasting business. He knew the value of personal relationships in such a trust-based industry. In 1984, a young engraver Ken Hulke joined the Caruso's family. Ken (a second generation engraver) was around the jewelry store growing up so it was a natural fit. 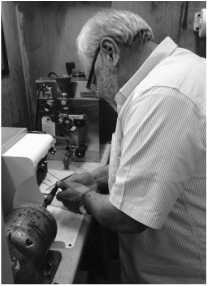 Over the years managing the store he honed his engraving skills and taught himself the art of jewelry repair. In 2001, Ken became the proud owner of Caruso Jewelers. Shortly after, Ken's youngest son Ken Jr. finished his training at the historic North Bennet Street School in Jewelry Making and Repair. With over 40 years combined experience, the Hulkes are still running things the way Ernie would have liked them to. Deals are done with a handshake. Your heirlooms are expertly restored by our two full-time goldsmiths in our full-service on-premises repair shop. Whatever you might be looking to purchase for your special anniversary, birthday, holiday - we have it.